After a miscarriage, you may want to find some special way of remembering your baby and marking the loss of his or her brief life. Our Stars of remembrance section age offers a special place to mark the brief lives of babies who died before they were born, with messages attached to stars in the night sky. We are now adding stars to the Stars of remembrance (Sky 2) but you can still visit those in Sky 1. Days that Matter offers a space to post your thoughts and feelings, together with an image and perhaps a pledge or action. You may want to hold some kind of ceremony or memorial service. This might be in your place of worship, in another place that’s special to you or at home. It could be just for close friends and family or just you and your partner. Erin and her partner created a special place in their garden for their miscarried baby. Some hospitals organise annual services of remembrance for babies who have died in pregnancy, at birth or later. The hospital chaplain will be able to tell you. Services are sometimes organised by Miscarriage Association local groups, especially during Babyloss Awareness Week, October 9-15. You’ll find details of several charities’ events here. There are Christian remembrance services that take place in a number of cathedrals across the UK throughout the year. And you can find Christian prayers and liturgies on the Saltwater and Honey website. If you are looking for Jewish prayers or ceremonies, you can find some here and here, or search for ‘miscarriage’ on the ritualwell website. You can find suggestions about Muslim prayers and practice, as well as support, from the Children of Jannah website. And here is a Muslim perspective on supporting someone after pregnancy loss. You might also find comfort in the Japanese Jizo concept, described here. We can provide information and guidance for hospitals wanting to provide a certificate, which you can find here. Plant flowers, a shrub or tree in your garden or in a local garden of remembrance. I sowed Viola Heartsease seeds all on their own in a pot and when they flowered, they were so small and perfect – a fitting reminder of my losses. 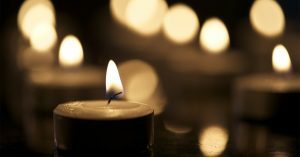 Light a candle on anniversaries and other special days, such as during the Wave of Light on Babyloss Awareness Day, 15 October. Buy something special in memory of your baby, such as a piece of jewellery (the remembrance jewellery here also supports the Miscarriage Association). Write a letter or poem for your baby and perhaps keep it in a memory box. We have some examples below. Make a donation to a favourite charity or do some fundraising. I ran the London Marathon for the Miscarriage Association. I felt it would be a fitting way to honour my baby, whilst helping a charity which had a special significance for me. 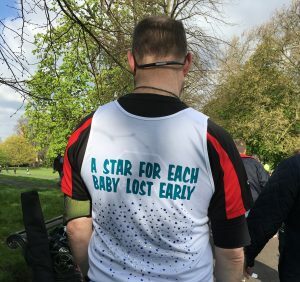 Chris’s running vest includes hundreds of tiny stars, each one added in memory of many other people’s babies lost in pregnancy – just as his wife Nicky’s skirt did the year before. Don’t feel that you have to do something to mark your loss. You may feel it will make things worse or it may just not feel right for you. There are no right or wrong ways to deal with pregnancy loss.